The eye is lost in the 16 hectares of brackish lagoons, where eels are caught and shellfish is raised. The small town is placed exactly at sea level in a basin at the heart of the Po Delta. Possibly founded by Etruscans (the archaeological site of Spina is only 4 kilometres away), Comacchio was ruled in turn by the Exarchate of Ravenna, the Duchy of Ferrara, and the States of the Church. Ariosto described it as “la città ch’in mezzo alle piscose paludi, del Po teme ambe le foci, dove abitan le genti disiose che ‘l mar si turbi e sieno i venti atroci” (“the city which fishy marshes round enclose, and Po’s two currents threat with double breach; whose townsmen loath the lazy calm’s repose, and pray that stormy waves may lash the beach”). Of the rule of the House of Este only the plan of the historical centre remains, because in 1509 the Venetians mangled the town and its saltworks. So the buildings one can admire today, however fascinating, were built only later. 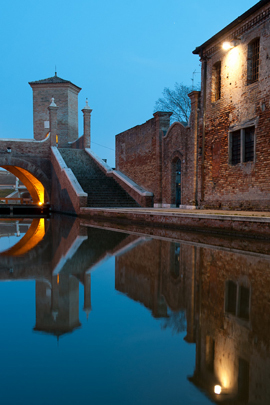 The “small Venice” still enchants the visitor though, and despite the drainage of most surrounding areas and the filling of some city canals, the thirteenths islands on which Comacchio thrived can be still recognised. The islands are joined by a series of historical bridges, first of all the one laying across three canals, and featuring five arches and as many stairs: Trepponti. Equipped with two defensive towers, it was created by Luca Danesi, an engineer from Ravenna, in 1634. The Church of the Madonna del Carmine, the oldest in town, dates to the same period. Another important piece of local history is the Manifattura dei Marinati, today both a part-time factory for some months of the year and a museum. Among the other places of interest, we must remember Palazzo Bellini, a lavish building by the local standards, placed by the Ponte degli Sbirri: built in the second half of the 19th century, nowadays it hosts the Library and the local Historical Archives. The same building complex includes the museum displaying the Roman ship which was found in 1981 in the marshes. Not far from the Ponte degli Sbirri, the Antica Pescheria: created in the 17th century and restored in 1887, still operates as a fish market. This portrait of Comacchio could not be complete without the “Casone Foce”: once an important fishing station, today it hosts the restaurant Bettolino di Foce, not far from the boarding place for the cruise in the lagoon. 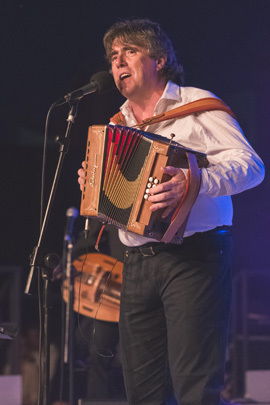 Ambrogio Sparagna in collaboration with other artists such as Francesca Trenta e Peppe Servillo will combine the rhythm of "his" taranta with folk lullabies and sea songs.